Community hero – Kay Howe, whose son contracted rat lungworm disease, has worked tirelessly to inform the community about the damage the parasite can do. She has launched a program to educate students at five K-12 schools on Hawai‘i Island on the dangers of the disease. Business leader – Young Brothers, Ltd. was recognized for its initiative and response in stopping the spread of Rapid ‘Ōhi‘a Death (ROD) by halting shipments of ‘ōhi‘a products from Hawai‘i Island. Greatest hit – J.B. Friday, Flint Hughes and Lisa Keith, a dedicated team of researchers and UH specialists, were praised for their outreach to conservation professionals and the community to inform them about ROD. Hottest Pest Report – Laura Hew won recognition for her efforts in stopping the spread of the Giant Day Gecko, using the 643PEST reporting system and notifying the state’s Department of Agriculture. 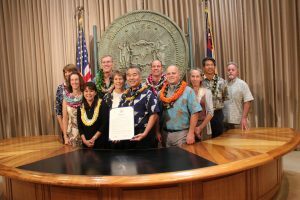 Also honored were MVPs from each of the state’s counties: Judith Houle, Hawai‘i; Dr. James Leary, Maui; Paul Zweng, O‘ahu; and Trae Menard, Kaua‘i.